Chelsea are going through a sort of a rough patch as of late, conceding 2 defeats in the last three games, the latest being a shock 2-1 defeat away to Wolverhampton. 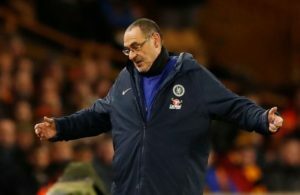 Manager Maurizio Sarri cast doubts over the attitude of his players after the match, saying that Chelsea were “another team” after conceding the first goal at the Molineux Stadium. Chelsea started the game well, scoring through Ruben Loftus-Cheek in the 18th minute and the Blues led till the 59th minute when Raul Jimenez equalised for Wolverhampton. The home team bagged the winner four minutes later through Jota to earn a famous victory over the London heavyweights. Maurizio Sarri however said that it was not the result that bothered him, but the fact that his team failed to conjure up a response after conceding the first goal. “After the first [Wolves] goal – that was an accident because we were in full control of the match – we were suddenly another team, without the right distances, without our football. I don’t know why. I am really worried not for the result but for the fact that we didn’t react to the first goal of the opponent.”, Sarri said at the post match interview. Chelsea face a daunting task this weekend at Stamford Bridge when they host leaders Manchester City, who are ten points ahead from the Blues at the top of the table. Sarri, who has reportedly given up title hopes for this season after the Wolves defeat, admitted to being intimidated by the prospect, claiming that City was the best team in Europe this season.